If you are looking for a different gift, complete and leave a good taste, do not hesitate and look at the different proposals we offer, from a dinner under the stars with the best views of the city of Barcelona, a weekend away from the Mundane noise of the city or a visit to a building that has hosted much of the Catalan medical history. The gifts voucher have 1 year of validity from the date of purchase. Remember that the beneficiaries must previously book using the telephones arranged in the gift box, they can not be presented without validating the check previously in a reservation. Activity held from June to October combining scientific outreach with a dinner in a privileged spot, a guided tour to the museum and the galleries of the art nouveau building, and a night sky observation through the 1904 telescope. The Dinners with Stars reach this year their fourteenth edition. Come and enjoy a magical night at the Requesens Palace, let yourself be hypnotized by the dancers, solve the mystery and savour a menu of Persian inspiration. A unique experience in Barcelona! Knights fighting in armors, Arabian dancers and jugglers playing with fire, in the palace courtyard. A show that will not leave you indifferent! A gastronomic game designed to fill us with sensory perceptions based on illusionism, mentalism, flavors, colors, smells and textures. Guided tour of the jewish quarter, entrance to the Major Synagogue, guided tour at the Requesens Palace and jewish dinner. Give the experience of solving an enigma in one of the most emblematic and mysterious buildings that houses the city of Barcelona. Night guided tour, conference, observation through a telescope and views of Barcelona from the outside of the dome. Give this magnificent visit to the headquarters of the first association responsible for recreating, planning and projecting the entire Catalan territory. Impress with this guided tour at Balmesiana's Palace. A chapel by Joan Rubió i Bellver, sculptures by the modernist Joan Llimona and historical-cultural explanations about the building and its years of life. A complete visit to give to the most avid knowledge. Guided tout with a glass of cava Requesens Palace of Barcelona on Friday or Saturday. Discover the largest medieval palace in Barcelona, ​​visit its interior and let yourself go to an earlier era. Learn about the life and customs of the Requesens family and its most important member, Isabel de Requesens. 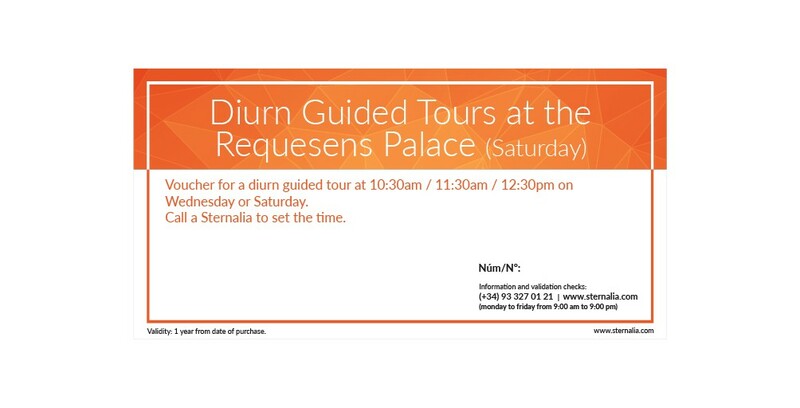 Diurn Guided tour on Wednesday or Saturday at RACAB. There are three different schedules: 10:30am / 11:30am / 12:30pm. Weekend activity with and astronomical talk, dinner and night observation through a telescope. Saturday night accommodation, and Sunday breakfast is included. Meet three emblematic areas accompanied with a gastronomy that will not leave you in indifferent, enjoy a telescope century, a fire juggling show or be impressed by the anatomical amphitheater of the RAMC. Give culture with this pack of visits to different areas of the city of Barcelona.